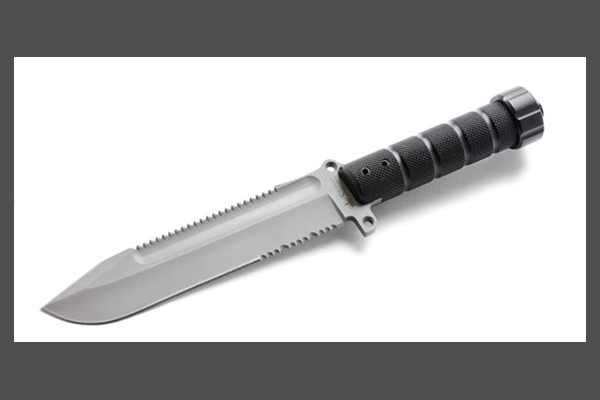 Kizlyar Supreme’s Survival knife “Survivalist” features a large, powerful blade with thickness of around 5mm. The blade has a protective lower guard to shield the user from the very sharp serrated edge. The upper and lower guard are drilled, and chamfered for fastening a lanyard as needed. The durable handle is securely connected to the blade. A common point of weakness in hollow handle survival knives, Kizlyar Supreme’s attachment method is a superior design that has passed numerous strength tests. Inside the Dural handle there is a basic survival kit that can be modified to suit the user’s needs and experience.